On the final day of the 1934 season, in a feat that combined ironman endurance with exceptional skill, Dizzy Dean carried the Cardinals to the National League pennant by pitching his second shutout in the span of 48 hours. 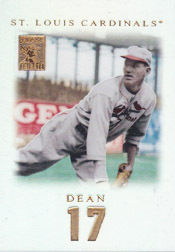 On Sept. 30, 1934, Dean earned his 30th win of the year in the Cardinals’ 9-0 victory over the Reds at St. Louis. Dean became the first National League pitcher to achieve 30 wins in a season since Grover Cleveland Alexander of the 1917 Phillies. Dean’s performance enabled the Cardinals to finish a game ahead of the Giants and propelled them into the World Series against the Tigers. The Cardinals, who trailed the first-place Giants by seven games on Sept. 7, won nine of 10 between Sept. 16 and Sept. 25. On Sept. 28, the Cardinals were a half-game behind the idle Giants entering a Friday afternoon game against the Reds at St. Louis. Dean started and pitched a shutout. The 4-0 victory moved the Cardinals into a first-place tie. The next day, after the Cardinals beat the Reds and the Giants lost to the Dodgers, St. Louis was alone in first place with a game remaining. Cardinals manager Frankie Frisch chose Dean to start the Sept. 30 finale. It would be Dean’s fifth appearance in eight days. The Cardinals could clinch the pennant _ their fifth in nine years _ on Sept. 30 with a win over the Reds, or a Giants loss to the Dodgers. If the Cardinals lost and the Giants won, a playoff would be needed to determine the league champion. “Give me a couple or three runs _ there ain’t going to be any playoff,” Dean said to his teammates. Playing at the Polo Grounds, the Giants scored four in the first, but the Dodgers rallied. The score was tied at 5-5 after nine innings. At St. Louis, before a packed house of 35,274, Dean and the Cardinals were cruising. Bill DeLancey drove in four runs. Rip Collins hit a two-run home run for his 200th hit of the season. Entering the ninth, the Cardinals led, 9-0. The Reds, though, opened the ninth with two hits and a walk, loading the bases. “Grinning in that cocksure way of his, Dizzy arose to the heights,” the Associated Press reported. Dean struck out Clyde Manion. Ted Petoskey was up next. Dodgers 8, Giants 5, in 10 innings. The loss eliminated the Giants and assured the Cardinals the pennant. All that remained to be settled was whether Dean would get the shutout. Sparky Adams followed by fouling out to the catcher. “A few minutes later … five cops were escorting Diz to the dugout as thousands of fans swept onto the field,” Gregory wrote. The Cardinals celebrated their pennant by swigging soda pop. The final stats for Dean that season: 30-7 record, 2.66 ERA, 50 games pitched, 33 starts, 24 complete games, seven shutouts and 311.2 innings pitched. Dean won Games 1 and 7 of the 1934 World Series and was chosen the recipient of the National League Most Valuable Player Award.